This is it, last stretch to get your menu ready in time for Easter. If you find yourself as confused as I am wondering what to serve to your family on this day, then painted eggs, ham and salmon are what everybody is enjoying in North America. In Romania and a lot of other Eastern Europe countries we serve lamb too, which can be made into a soup or roast or other interesting things that might turn your stomach inside-out (lol). One other thing that my mother is making on Easter (and any other holiday for that matter :P), is a mean walnut sweet bread, though the one in the image was actually a family event made in Canada that happened few years back, but you all get the idea. My other new discovered passion, because this is definitely not a Romanian tradition afaik, are these delicious hot cross buns that I decided to share with you today. Recipe is pretty basic from what I gather but taste-wise, there is nothing classic about it. Enjoy! In a small bowl combine the lukewarm milk, sugar and yeast. Stir and let it rest for about 10 minutes until the yeast becomes frothy. In the bowl of your mixer add 4 cups of flour, salt and nutmeg; mix for a bit. Add the eggs and butter to the yeast mixture and stir. Pour the yeast mixture over the flour, and using the dough hook attachment mix for about five minutes. Add raisins and continue mixing for another minute. If the dough is too wet add more flour as needed, it should be quite soft and elastic. When it doesn't stick to the bowl, you are good to go. Place the dough in a plastic bowl, cover with a damp towel and let it rise for a couple hours or until doubled in size. Preheat oven to 375° F / 190° C. Line a 12x16 inches baking sheet with parchment paper. Meanwhile, get started on the syrup by mixing the sugar with the water in a sauce pan and bring to a boil over low heat. Continue boiling for another minute or until syrup thickens a bit. Set aside. To make the icing, whisk all the ingredients together and pour in a piping bag and refrigerate until ready to use. If the icing is too thin add more icing sugar, if it's too thick add more water until desired consistency. When the buns are out of the oven, brush with the sugar syrup. Let cool for about 5 to 10 minutes then pipe the icing over the buns to form a cross. Made these today for Easter. Excellent! 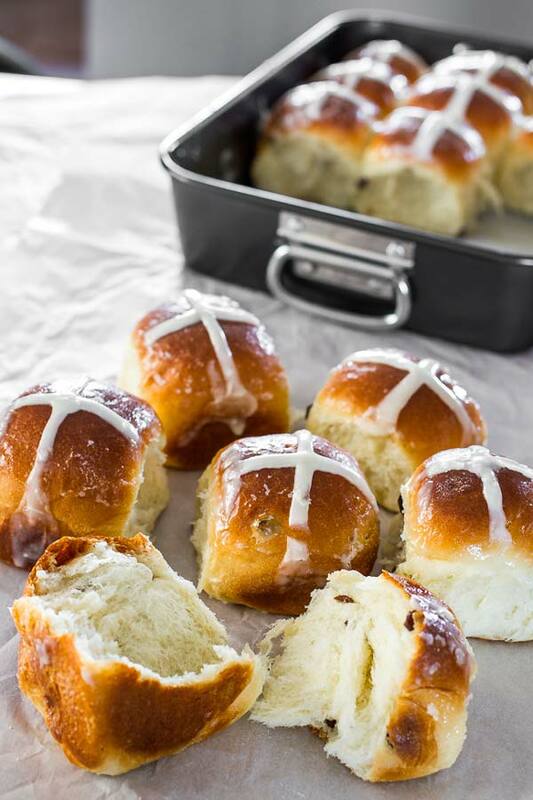 Go light on the vanilla in the icing, as the vanilla tends to darken the color, and hot cross buns look better with a bright white cross.